Birds of prey hunt and eat their prey, which are usually small animals and insects, such as rabbits, fish, snakes, mice and voles, and even, as in the case of vultures, dead and rotting carcasses. Their talons (claws) are curved and sharp, as is their beak. They have excellent vision and can spot a small animal from as far as two miles away. They require large areas for hunting and nesting, and loss of habitat is taking a toll on their populations. If people had a better understanding of the value of raptors in keeping unwanted “critters” from over-populating our human areas, we would show greater appreciation for their service to humanity and be glad to share our space. 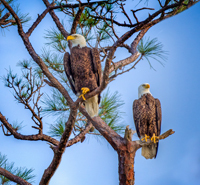 You’ll spot eagles nesting in the tall trees near rivers, lakes, marshes, and along the coastline, looking for fish, water fowl, or small animals. Eagles have an eight foot wing span and can soar up to three miles high. The Bald eagle’s distinctive white head and tail feathers develop at about age four. The feet, beak, and eyes are a golden color. The mating ritual of eagles is an acrobatic aerial display rivaling a performance of Cirque du Soleil. The two enormous birds circle and dive at each other, locking claws and tumbling with their massive wings outstretched as they plummet through the air. Eagles mate for life and can occupy the same gigantic nest as long as ten years, provided neither mate dies. A surviving eagle will sometimes take a new mate. The female eagle lays 1-4 eggs that hatch about a month later, but days apart, giving the first eaglet a size advantage in case of food scarcity. At one time eagles were considered a nuisance to livestock and were killed in large numbers. Today, their greatest threat is loss of habitat, pollution and other environmental toxins, and especially from contact with trucks and other vehicles. Ospreys live near rivers, lakes, estuaries, and coasts worldwide. Sometimes ospreys make their huge nests high on the top of a telephone pole or Bald Cypress tree. Ospreys even make their nests on a seemingly precarious ledge underneath a bridge. They have 1-4 eggs in their nest once per year. They are also known as “fish-hawks” for their habit of swooping feet first into the water to grab their prey. When a fish is too big to carry, the Osprey is unable to let go. Some people say that the excitment of the catch stimulates a locking mechanism. Others believe the claws simply sink into bone and get stuck. Whatever the reason, fishermen have caught large fish with Osprey feet attached. These unfortunate birds perished by the same unique ability that enables them to survive. Florida’s owls include the small Eastern Screech-owls and Burrowing owls and the large Barred owls, Great Horned owls, and the Common Barn owls. All owls have “tunnel vision” in that their eyes cannot move from side to side like us, but focus straight ahead. To compensate for this, they are able to turn their heads almost completely behind themselves to follow the movement of small animals. They have keen eyesight in dim light, which allows them to hunt at night when their prey is on the move, and they have sharp hearing. An unusual trait of owls is that their flapping wings make no sound because of their soft wing feathers. They perform a great service by controlling the rodent populations and smaller owls eat insects harmful to crops. After eating their prey, owls regurgitate the hair, teeth, and bones in a round “pellet.” It’s great fun for a science class to dissect the pellets to determine what it ate. One way to help owls is to leave “standing snags,” dead trees that are cut off high and left standing for owls to nest in the cavities. The Snail Kite resides ONLY in southern Florida and eats a very specific freshwater snail, the apple snail, leaving it vulnerable to extinction from any disruption to its extraordinarily particular survival requirements. This wetlands bird, formerly known as the Everglades Kite, suffered when wetlands were drained, or even too much water pumped in, causing an imbalance in the amount of water required to maintain a healthy habitat. Water quality is affected by agricultural runoff, which poses another problem for the Snail Kite and apple snail. The Swallow-tailed kite is a black and white bird of prey that dines on insects and small vertebrates, like lizards and snakes. In late summer and early fall, Fisheating Creek Wildlife Management Area is the recipient of a thousand birds or more that “stop over” on their way to Brazil for the winter. You will see them flying gracefully on high with the distinctive sliced tail. Crested Caracaras can sometimes be seen dining on carrion along with vultures, though they will eat insects, eggs, and vertebrates as well. They are found mostly in the interiors, around the Tamiami Trail and north to Orlando. The Audubon’s Crested caracara is the subspecies found here and there are only an estimated 250 nesting pairs in the state. They are a federally threatened subspecies. Vultures are exceptionally large, scavenging raptors with featherless heads. They are sometimes referred to as condors or buzzards. These magnificent birds of prey keep roadsides and woodlands free of dead animals. The Turkey vulture and Black vulture are the two found in Florida and you can spot them riding air currents high above the treetops or on the ground eating carrion. Unfortunately, vultures face many threats, including lead poisoning from contaminated carcasses. Birds are one of the most visible groups of wildlife. However, it helps if you have the proper equipment. Using and understanding some basics about bird watching equipment is a key to enjoyment and success as you conduct your monitoring projects. First, find a field guide that you like. There are many from which to choose, but decide which guide fits your skill level. You’ll want to take protection from the elements (safety first) so be sure to have a hat, sun protection, sunglasses (get 100% UVA and UVB protection), and bug repellant. You’ll certainly want to have a pair of binoculars. They allow you to see more detail to better identify birds. Binoculars don't have to cost a lot of money, but must adequately magnify birds for identification. A camera will be a good idea and maybe a compass, too. And don’t forget to take enough water so you don’t get dehydrated. Be sure your shoes are comfortable and appropriate to the environment.